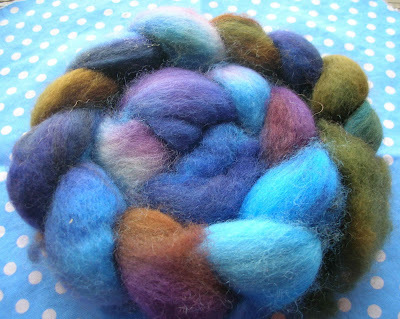 This is Fleece Artist hand dyed Blue Face Leicester, called Peacock. Yesterday a client cancelled, so instead of rustling something else up I spun. Well, wouldn't you have? So anyway, the above became this. I discovered a few things spinning this batch. I only had one sliver (the guy you see curled up in the first picture) so I broke it in two and spun two bobbins. 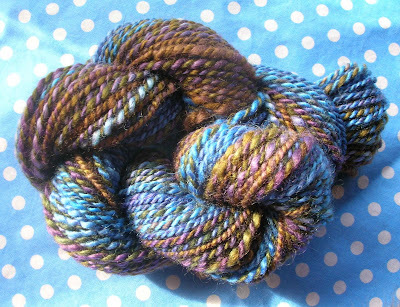 When I plied them, my blues came out together and the darks came out together, not what I was wanting. I could have planned that a little better. Also I had quiet a bit left on one of the bobbins. If I had weighed both half slivers before I began, I would know if it was my spinning that differed so much. I can't tell you how exciting it is to play with colour in this way. It really is magical. Today I got a vegetable steamer at Value Village, to make my own painted rovings!!! Gorgeous colors. It's always so interesting to drop in and see what you are spinning.